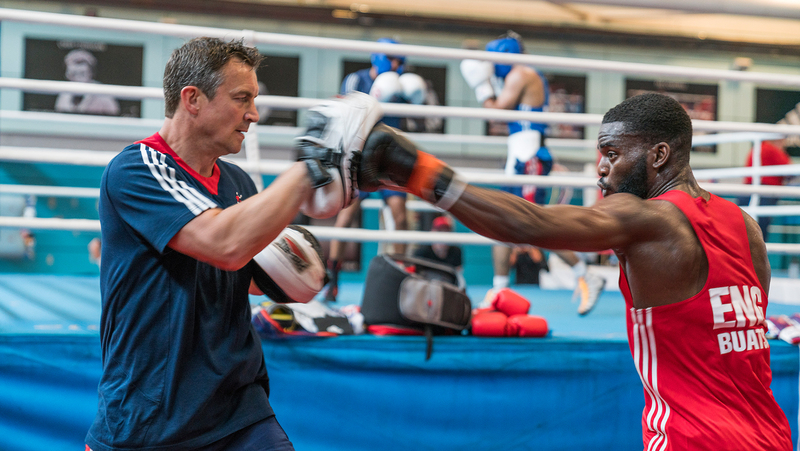 GB Boxing Podium coach Dave Alloway explains how a set of simple drills can help increase your hand speed. I’m 60kg and 17-years-old and I’ve only been boxing for a year. Over that time I’ve been trying hard to increase my hand speed and it’s just not improving much. I’ve been doing dumbbell punches with 1-2kg weights and have noticed a little change, but not much. What exercises can I do to improve my speed, and how often should I do the exercises? “You can continue with the dumbbell punches, but to increase your hand speed and reactions you should also try some simple speed and reaction exercises. 1) On a wall opposite you, mark out two rows of three spots, evenly spaced. 2) Number the spots from one to six. 3) Ask a friend or your coach to shout out the six numbers at random and, using your jabbing hand, touch the numbers as they are shouted. Gradually increase the speed at which the numbers are shouted to improve your punching speed and reactions. 1) Stand facing a wall pad or punch bag. 2) Ask your coach or a friend to hold a skipping rope in one hand and turn it by the handles in front of the the bag or wall pad. 3) In between rotations punch through the skipping rope at the bag or wall pad, without letting the skipping rope touch your glove. Your coach can vary the speed that he or she spins the rope as you get used to punching through the rotations. 2) When the object is released try to catch it with your punching hand as it falls. You’ll find this difficult at first, but gradually your reaction time will improve with practice.